The Triage tool displays crashes or errors grouped by fingerprint and offers a set of actions to take to support resolution. View and Manage by State - Use Filter Shortcuts like Open, In Progress, Muted or Resolved to view fingerprints that are relevant to your activity in the Triage view. View Details - Each Fingerprint has a Details view which provides more context for the fingerprint, including some analysis of attributes associated to the crashes, a list of all the instances of this fingerprint, ability to tag and comment, and some quick actions to Debug the latest trace or view a larger Instance table list. 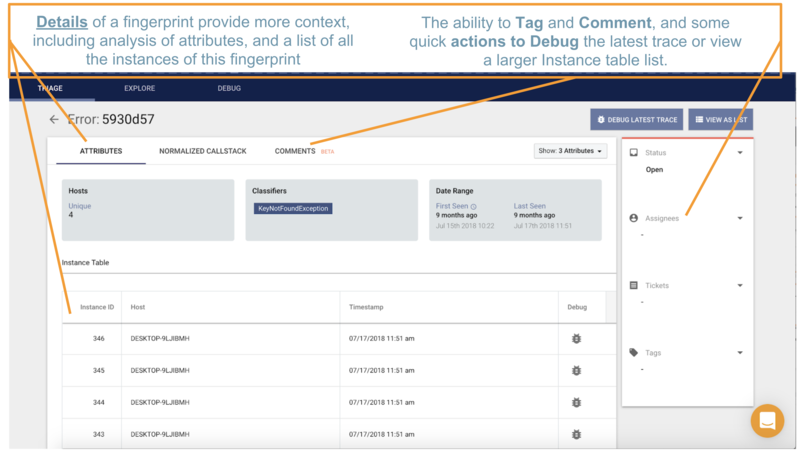 Assign - The fingerprint can be assigned to a user in Backtrace to indicate there is a user that is responsible to resolve it. Link to Issue - A user can create a new issue in a 3rd party system like Jira or GitHub Issues that is populated with some information about the fingerprint, and a link back to more details about the fingerprint in Backtrace. Comment and Tag- A comment thread is available in the Details view of a fingerprint. Tags can be applied to fingerprints for more ad-hoc grouping and classification. Merge / Unmerge - If you find 2 or more fingerprints that should really be grouped together, take the Merge action to create a new fingerprint to group future incoming errors into. The remainder of this documentation will discuss how to work within the Triage tool with a review of filters, a discussion on how to navigate the result list, and more details on how to apply actions. 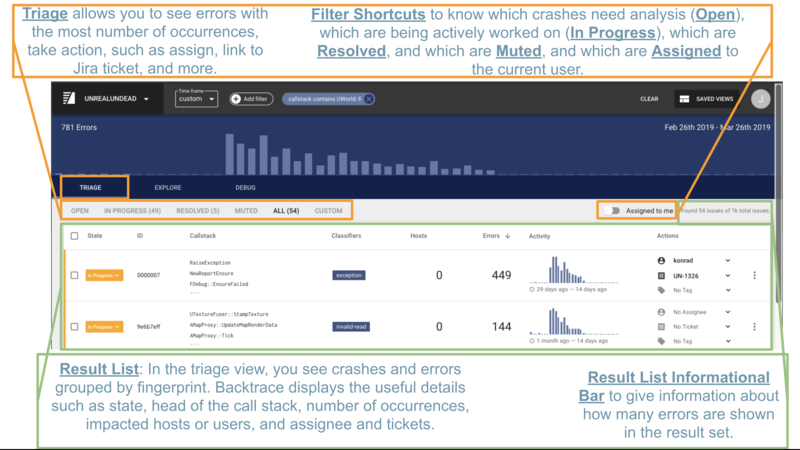 In the Triage tool, you'll notice shortcuts to apply Open, In Progress, Resolved, Muted or All state filters. These states help engineering managers and engineers know which crashes need analysis, which are being actively worked on, which are resolved, and which can be ignored or muted. There is also a shortcut for "Assigned to me" to view crashes that are assigned to the current user. View and modify the state from Open/In Progress to Resolved and Muted. View crash or error ID of the fingerprint and head of the call stack. View the number of occurrences and number of impacted hosts or users, and activity history. View system applied tags (classifiers), and manage custom tags. View and manage assignees and linked tickets. Select multiple fingerprints to take the merge action, or other bulk actions, such as assignment, mute, or resolve. Fingerprints can be marked as Resolved or Muted using the state column. Fingerprints that have been marked as Resolved or Muted will stay in that state, to allow you to better organize the expected state of instability in your environment. A fingerprint is Open if there are no assignees or linked tickets (and has not been marked as Resolved or Muted). The act of assigning a fingerprint or linking it to an issue will cause the Open fingerprint to be listed as In Progress. By the same notion, a fingerprint that is In Progress and has its assignees removed and tickets unlinked will be listed as Open. This section will discuss the actions you can take on a fingerprint. The fingerprint can be assigned to a user in Backtrace to indicate there is a user that is responsible to resolve it. This action also sets the state of the fingerprint to In Progress. A comment thread is available in the Details view of a fingerprint soon. Users can post and edit their comments to assist in the resolution flow. Tags can be applied to fingerprints for more ad-hoc grouping and classification. You can take explicit Mute or Resolve actions on a fingerprint. Mute a fingerprint when you don't want it to appear as Open or In Progress any more. Mark as Resolved when you think the issue is fixed. Fingerprints that have been marked as Resolved or Muted will stay in that state, to allow you to better organize the expected state of instability in your environment. If you find 2 or more fingerprints that should really be grouped together, take the Merge action to create a new fingerprint to group future incoming errors into.